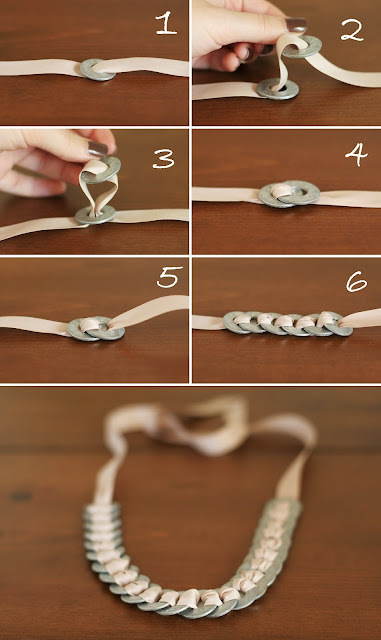 Thread your ribbon up through washer #1, leaving enough ribbon on the end to tie the necklace when it's finished. Thread the ribbon down through the top of washer #2. Thread the ribbon back down through washer #1. Pull the ribbon tight, so washer #2 is laying flat on top of washer #1. Thread the ribbon back up through washer #2. Repeat steps 2 through 5 for each additional washer. Once you've threaded all your washers onto the ribbon, tie the two ends of the ribbon together and trim off the excess. Finished! Easy, right? I love this. I saw a pop top bracelet that used a similar technique. I love using hardware store finds. i will be making one of these or more, for sure. thanks so much for the tut. I am having a hard time finding washers this large. So excited about my new necklace... and for less than $5! Thanks so much for sharing your creativity, Megan! I used a bag of 25 flat washers from Home Depot that are 3/8" and it looks just like the picture. I'm guessing that Megan measured the diameter of the entire washer, but the packages are labeled by the diameter of the hole? I found your blog via Pinterest from this diy - it's amazing! I'm so glad I found you and I can't wait to make this necklace. I made this today!!! Love it and turned out beautiful... word to wise... need about 3 yards (yep 3 yards); 1st time started with 1 1/2 yards and about 6 washers in noticed that I needed more... Eventually you'll cut off about 1/2 yard to 2/3 off AND this is a heavy necklace I'll probably give to my 25 yr old daughter and make a smaller/lighter weight (fewer washers) one for me... thanks again for the GREAT idea! Making this with Girl Scouts tonight! Thanks for all the tips. will be making these as gifts for a few friends. love this idea. I found your blog via Pintrest. Thank you so much for posting this DIY tutorial it's so cute! I made a couple of these today and posted it up on my own blog so I hope you check it out. Thanks for the great step by step photos. How cool is this idea....absolutely genius! Love it I definitely will make this one, when I have time! Hi, I'm Megan! I live in a small Ohio town and run an online handmade jewelry shop. I love to blog about personal style, everyday life, and other little snippets of things I like. Enjoy! Free shoes are the best kind of shoes. I'm feelin' Smokin' Hot today.